Check your diet and get in shape! 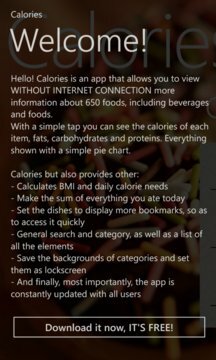 Download this app and monitors everything you eat. Available almost 700 items including food and drink , and TODAY I WILL ALSO BE INCLUDED IN YOUR DATABASE ELEMENTS FAVORITES ! In addition there are many other wonderful features, such as BMI calculators , ideal weight, daily requirement and much, much more!